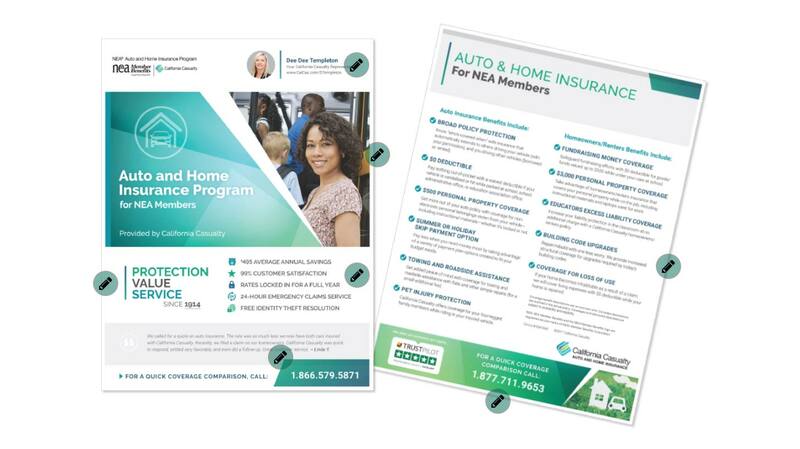 California Casualty provides insurance coverage for members who serve their communities. The organization relies on a wide network of field representatives to provide information and support for firefighters, nurses, educators, peace officers, and other related groups. With over 650 employees, California Casualty had grown exponentially in recent years. Its marketing tools and practices, however, hadn’t. An expanding network of field representatives across 44 US states required on-demand marketing collateral for site visits and client communications. Unfortunately, an inefficient system slowed the delivery of these assets. 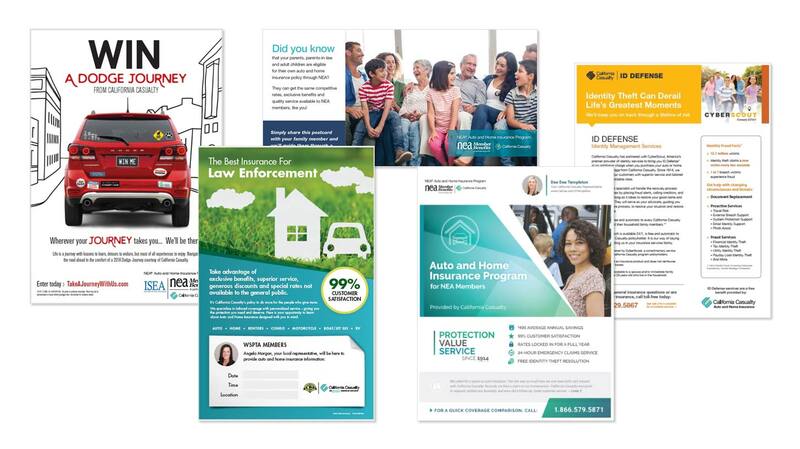 Static pdfs made customization impossible, and reps who tried to personalize materials ran the risk of threatening brand consistency or advertising benefits that weren’t applicable for specific groups or states. Far from intuitive, the software design kept usability low and frustration levels high. It even hurt vendor relationships, as the static assets required the company to submit endless customization requests. With a strong reputation, a history of over 100 years in business, and a niche market, California Casualty realized they needed a centralized marketing system that supported their greatest asset—their brand story. 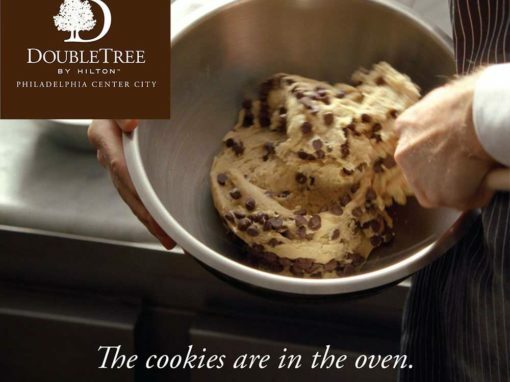 Provided 24/7 on-demand access to marketing collateral and digital assets. Improved the user experience with advanced organization and search features across audiences and states. Enabled user customization while protecting brand image through marketing templates. 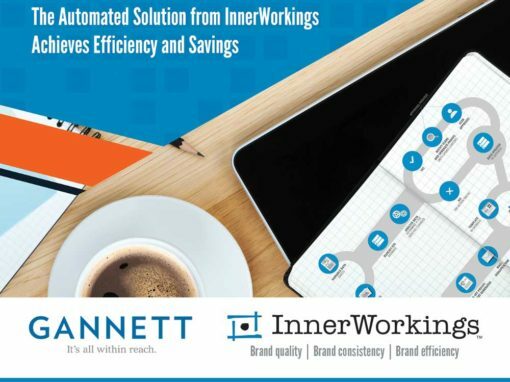 Integrated with current vendors and streamlined vendor communications and web to print delivery. 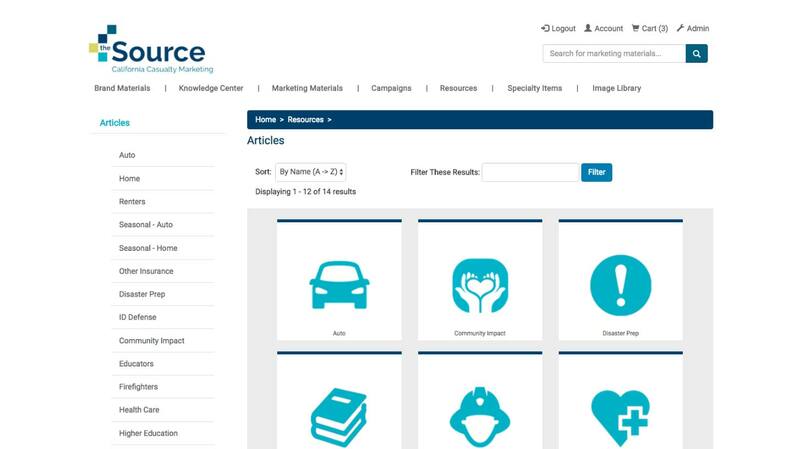 Gave users easy access to updated brand guidelines and benefit information. Complemented the end user behavior with an intuitive approach to increase use and foster engagement. The result wasn’t a “one-size-fits-all” system, but a customized solution built around California Casualty’s challenges and goals. 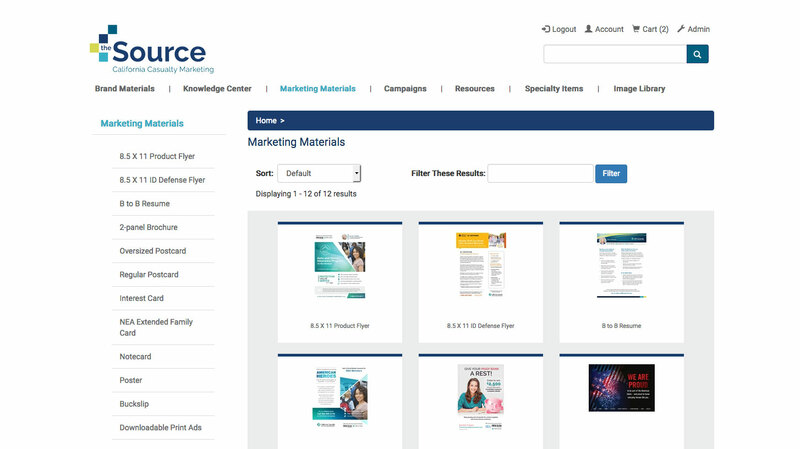 The Source enables users to create on-demand web to print collateral using custom marketing templates. Central marketing decides which elements remain fixed and which can be edited. The user-friendly system makes creating targeted marketing pieces simple and reduces the need for endless rounds of approvals and edits. The process also requires less vendor communication. Best of all, as new needs arise, new templates can be added to this scalable system. Within weeks of implementation, California Casualty noticed they had more of one of their most cherished resources—time. Even features like easy password retrieval freed up time for users and marketing executives, not to mention the impact of streamlined web to print design and delivery processes. Freed from the burden of micromanaging, central marketing had more time to analyze strategies, explore their market, and innovate engaging distributed marketing campaigns. End users love The Source, not only for its customization options, but for its intuitive design and user-friendly experience. These features made it possible to train end users in only a couple weeks. Not only did these users log into their accounts again within the first week of training completion—they also offered excited feedback as they explored the portal and created their own customized collateral. By maintaining an ongoing relationship with California Casualty, BlueSky ETO has been able to address new goals and challenges through a growing list of capabilities. 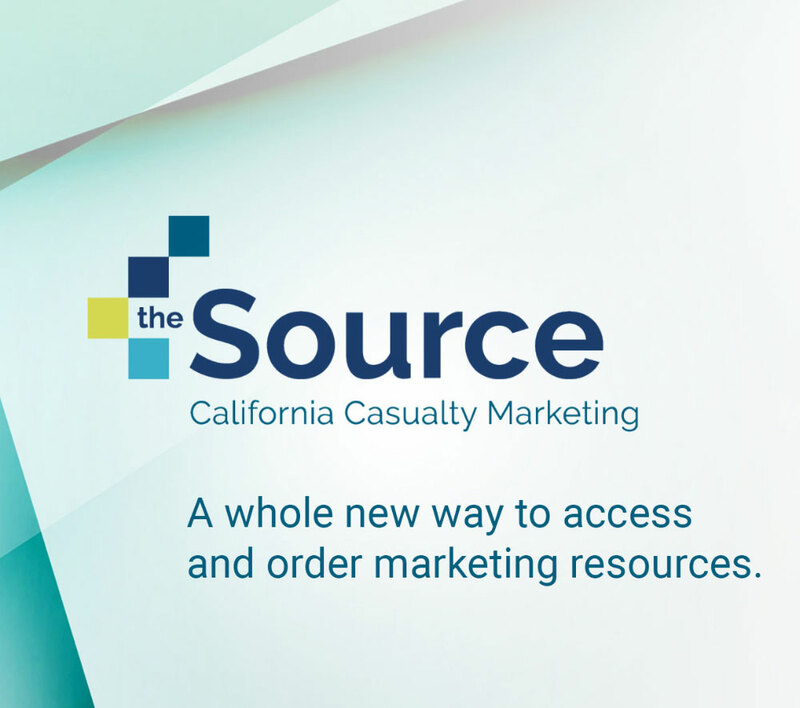 Digital Handwriting from Simply Written, Pitch Book support for presentations, and social media management tools are just some of the additional features that will make The Source an invaluable hub for every member of the California Casualty team.